Starfaring – Ken St. Andre's science fiction role-playing game – takes place in the year 2700. Naturally, St. Andre provides a 'future history' to expound the progress of civilization from now until then. First, humans reach Bernard's Star via a Bussard ramjet. On a dead world in that system, “explorers found a million year old base of some vanished alien race and a working starship.” As a result, mankind learned about subspace travel and the three types of Star Crystals: Brahma (related to power), Shiva (related to energy weapons), and Vishnu (related to energy shields). Even with this advanced technology, “It was already too late for the planet Earth, but thousands of elite groups were able to flee the over-populated, over-polluted homeworld and find new havens in the stars.” Over the course of a couple of centuries, humanity managed to colonize several hundred worlds. Then, without warning, the Robotics Wars started. Some say the Robots erupted from a depopulated Earth and spread their rebellion through the stars. Some say that Robotic electrical life represented the next step in evolution towards a smarter, more perfect organism. At any rate, the Robots tipped their plans too soon, and Humanity was able to fight back. For fifty years, Man was driven out of system after system by the totally superior Robotic race, which could seemingly build themselves to meet any function. The robot revolt trope is rather common. What does it say about us that we fantasize about our creations rebelling? 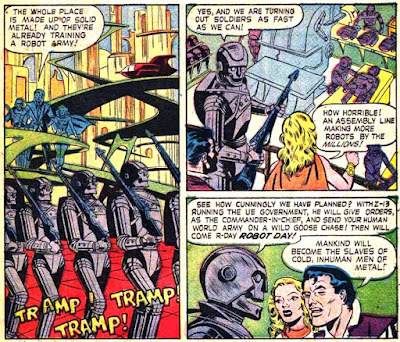 Maybe the robots have a perfectly good reason for wanting to exterminate or enslave humanity. Does anyone consider the robots' side of the story? Perhaps they don't even instigate the conflict. Where are the stories about robots resisting organic oppression? ...to keep...brains alive enclosed in an artificial lifesupport system. It was learned that such brains didn't accumulate any poisons as time went on, and the rate of cellular deterioration leading to senility and death slowed by a factor of 100. Such brains “are selfcontained in a metal shell...for safety.” These entities are therefore known as shell people. The second breakthrough is “the discovery that a star's gravitational field could be used to open a gateway into Subspace elsewhere in the universe.” Only affluent worlds have sufficient resources to establish these Star Gates. Regardless, “the Star Gates triggered an enormous surge of exploration” into sectors of space “that were vastly further away than Man had yet traveled from his own sphere of influence.” Worlds that control Star Gates sponsor expeditions through the Gates. Specifically, they are “willing to make colossal loans running into tens of thousands of megacredits” to citizens for the purpose of acquiring and outfiting “enormously expensive” scoutships. This is the state of affairs that allows a Ship Master (i.e., player) to engage upon an adventurous career in Starfaring.